In recent years, the death of a member of the Royal House has been announced by the prime minister on radio and television. The head of the Royal House also makes an announcement in a special edition of the Government Gazette. A memorial ceremony is then held in a joint session of the States General. 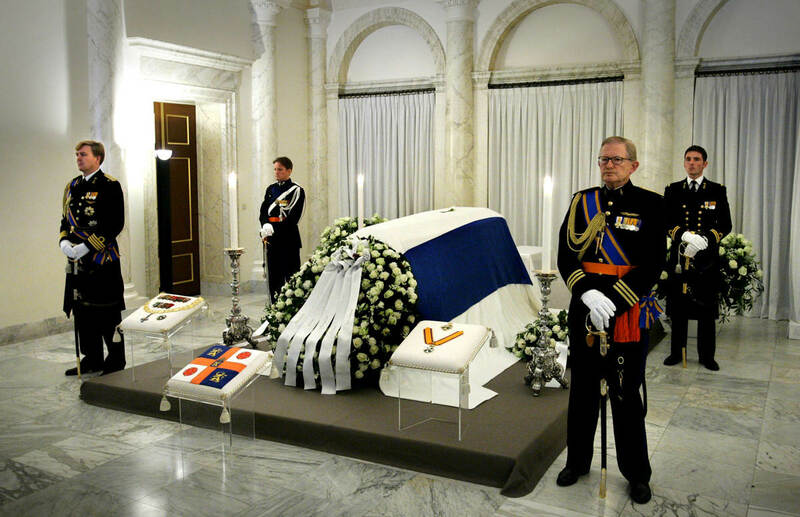 The Hague, 6 December 2004: Prince Willem-Alexander, Professor Pieter van Vollenhoven, Prince Maurits and Prince Pieter-Christiaan mount a vigil around the bier where the coffin of Prince Bernhard is placed, in the funeral chapel at Noordeinde Palace.